There may be no sign of offline caching on the horizon, but Netflix has finally realised how much we all hate watching the latest episode of House of Cards in 10-minute bursts on the morning commute - and it's going to do something about it. That's the word from Gigaom, which reports that Neflix is looking to add short video clips to a new section of the app, which will run between two and five minutes in length. However these clips won't be made of original content. Instead they'll be short scenes from TV shows or movies in the Netflix catalogue, or perhaps the odd clip from a comedy stand-up. According to Netflix design manager Dantley Davis, the company is testing this new content right now. A new section on the home screen called "Have five minutes?" will apparently appear for users, should the feature roll out successfully. 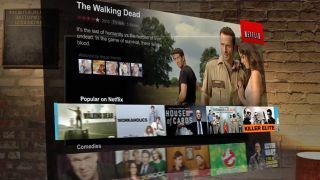 There's no word on when we might see this idea become a reality, but Netflix is making aggressive forward movement with mobile, so hopfully it won't be long.